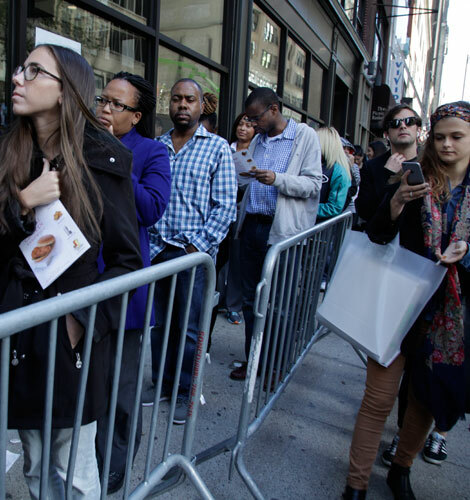 We sent a reporter to wait it out in rainy, hour-long lines to answer one question: is it worth it? 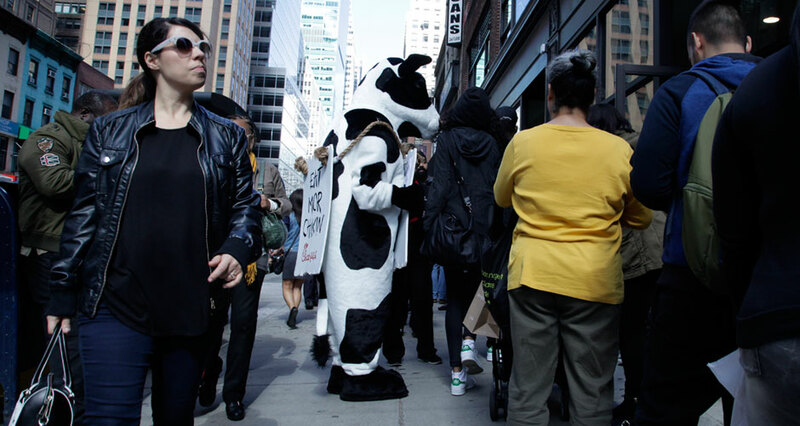 New York doesn’t need more fast food. It certainly doesn’t need more fried-chicken sandwiches. And it really doesn’t need any that come with outdated politics. 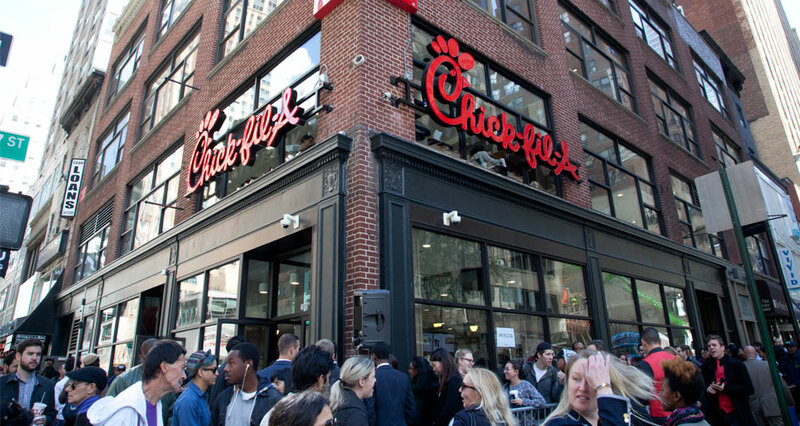 But Chick-fil-A feels ready for this market, and the lines outside of their new location in Midtown should offer a huge relief to golden bird mogul and socio-political chicken, Dan Cathy. Even so, we’re happy to have it, because like almost anything that shows up in NYC (actors, photographers, writers), everyone deserves a shot. I returned the next day on the occasion of their official Grand Opening to find a line that was half an hour long, snaking from 6th Ave almost all the way to 5th. The line on Monday was longer still, and I imagine will remain this long for some weeks while the store still gleams with novelty. At the Grand Opening there were more protesters: one group, Collectively Free, protesting for Animal Rights with a pro-gay spin, and a counter protest from a Christian hate group. 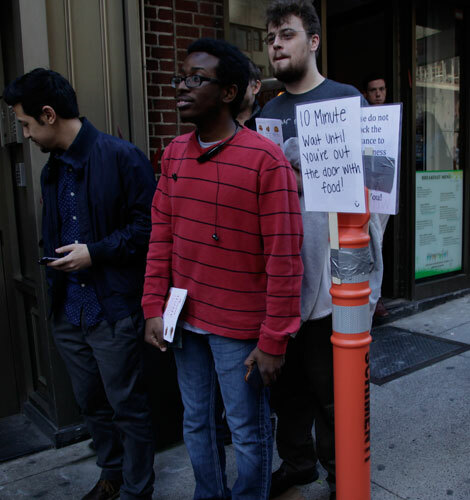 In classic New York-style, it didn’t affect the line at all, except for a few laughs when the protesters started yelling at each other. The line is remarkably speedy though, with wait times ultimately half the official approximation. Their ordering system is nontraditional: employees armed with tablets take your order as soon as you get through the doors. The very kind and accommodating employee then gives you a tag with the color register that you’re whisked away to after another brief wait in line. By the time you reach the register and the cashier calls your name, your food is already prepared. This speed is likely thanks to a very expedient kitchen that is keeping all items stocked and ready for the staff to stuff into the bags as needed. That means that you may get a sandwich that has been sitting for a moment or two and has lost its crispiness steaming in the bag. 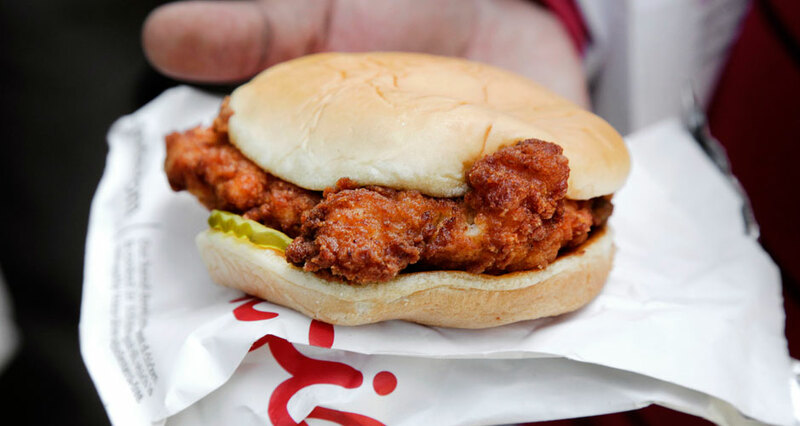 The fresh crisp of a Chick-fil-A sandwich is necessary to enjoying the experience, since there aren’t any bells and whistles with this meal; everything needs to be top notch. My suggestion is to ask for a minor change, like pickles on the side, and you’re likely to get something that’s more freshly made. If you want to wait for a seat, please do. But expect to wait for one almost as long as you waited for your food. There is pitiable seating in this new establishment; the rumored three storied restaurant isn’t this one, evidently. Wide tables overtake the single seating area, minimizing a space that’s already small. With a decade of NYU dining hall Chick-fil-A behind me, the only true new eating experience I had ahead of me was flirting with their sauces, best understood through an order of chicken nuggets. I tried each of them in turn and out of the seven, only two are remarkable—the Polynesian and Chick-fil-A. The Polynesian has an unconventional flavor profile, with elements akin to cinnamon and Allspice. 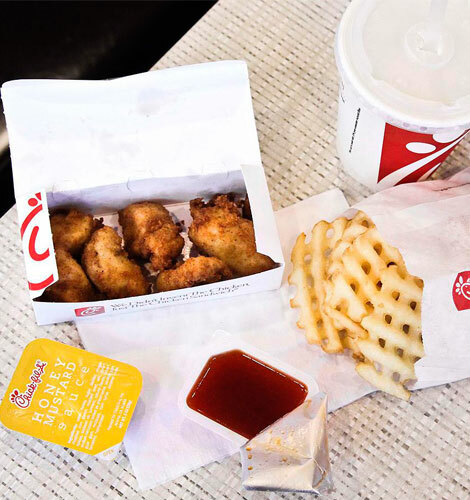 The best is the Chick-fil-A Sauce. Not so different from a honey mustard with a dash of BBQ, this one had an umami element that is hard to ignore. It may be nothing more than some milk powder and MSG, but it’s scintillating. 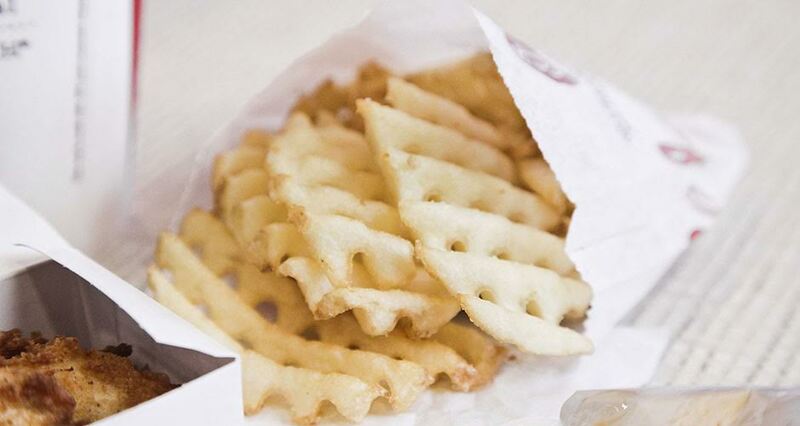 So far, I’ve found the fries at this Chick-fil-A to be terrible. They’re undercooked, cold, soggy, and dry. Maybe they’re also suffering from sitting too long waiting for their customers, or maybe they just need a few more moments in the fryer. I’m going to start asking for them extra crispy and see what they say. What’s most remarkable about Chick-fil-A is its customer service. Most of the dozen employees I interacted with treated me like some precious jewel—some precious gay jewel. It’s a strange experience to be treated so well by a company that has become the face of corporate anti-gay rhetoric in America. There’s a very strong “Hate the sin, Love the sinner’s money” vibe going on. 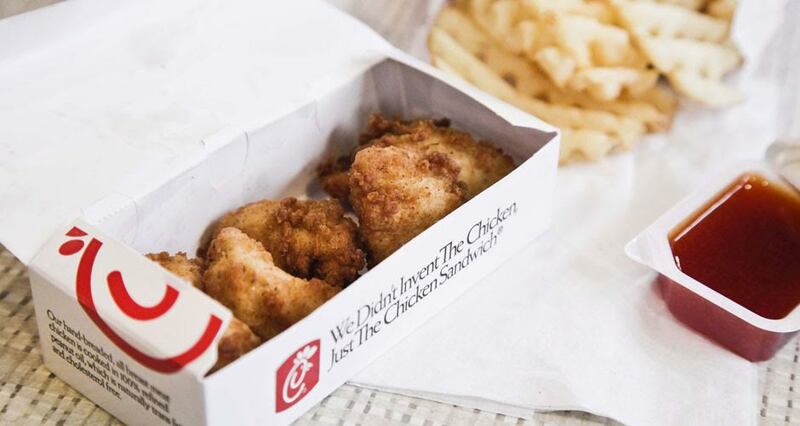 Chick-fil-A is unlikely to draw any customers from Fuku, and will likely have zero effect on the Brooklyn-only ChickenShack, but the lunch places in the area are now in trouble. The new kid is in town, with his Southern Hospitality and Dixie politics. But I don’t mind, honestly. They can take my money. They can give it to hate groups even. And those hate groups can print fliers and run ads and lose more elections. That issue has been settled. If they want to throw money in a fire, they’re welcome to it. And if that fire is heating oil that’s frying chicken: please save me a piece.